Sometimes I end up with an awful lot of veg in my fridge. I use bits and bobs throughout the week but despite my best brassica consuming efforts I still get left with some of it. These leftovers often end up in a soup (my autumn minestrone is a great way to use kale) but recently I wanted to make something different. I really like green veg with pasta so I grabbed my veggies, some gnocchi and cheese and set about making a gnocchi, kale and spinach gratin. Start by making the cheese sauce. Melt the butter in a small saucepan and then add the flour. Cook for a minute or two and then gradually whisk in the milk ensuring there are no lumps. Continue whisking the sauce until it bubbles and becomes nice and thick. Remove from the heat, add a little salt and plenty of pepper and stir through the cheese and mustard. Bring a large pan of salted water to the boil and add the gnocchi and frozen spinach. Place the broccoli and kale in a steamer over the top of the gnocchi, bring the pan back to the boil and cook for two minutes. Add the broccoli, gnocchi, kale and spinach to a roasting dish. Pour the cheese sauce over the top; it will dribble down and mix into everything. Sprinkle some extra cheese over the sauce and then place under a medium grill until the top is golden and bubbling. Some parts of the broccoli and kale get stuck at the top of the dish meaning they catch ever so slightly under the grill and have that deliciously toasted flavour. 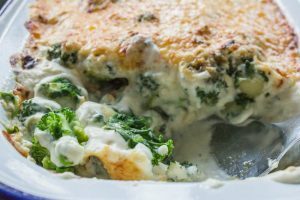 The crispy cheese topping is so rich in savoury flavour from the Parmesan and the smooth cheese sauce coats everything nicely. And thanks to the short gnocchi cooking time and grilling rather than baking this dish it’s ready in under half an hour. I think a few cherry tomatoes dotted over the top would add a lovely pop and freshness and using a blue cheese or a strong cheddar would be delicious if you happen to have those in the fridge too. Such a delicious gratin! I love esp. that you have added greens there. So much healthier and a great way to enjoy more veggies. Brilliant idea! I don’t think I’ve ever baked gnocchi before, but why not! I don’t think they’d be insulted in a lovely gratin such as this. They certainly wouldn’t be! I have fried them in the past too so they get a lovely crispy coating, definitely worth a try. I love love love gnocchi! 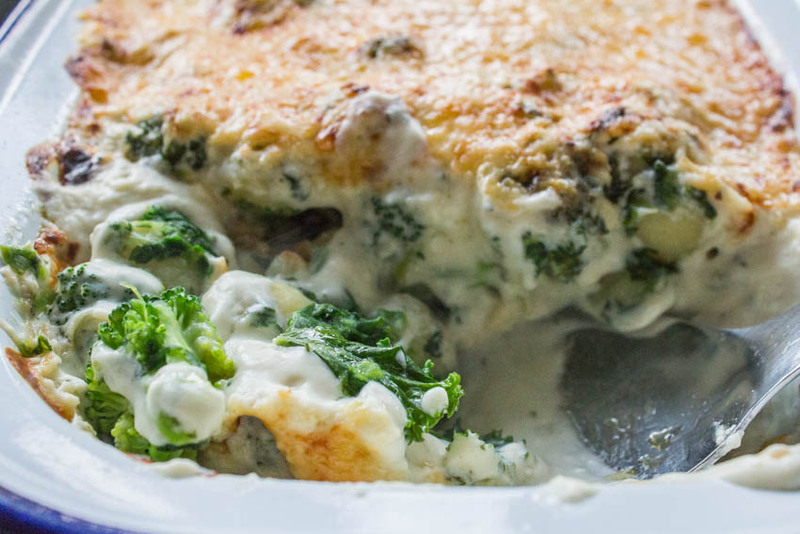 And this looks amazing – I’m totally into all the veggies – I have so many half bunches of kale right now to use up and this creamy casserole looks like a perfect way to do it! Thanks, Caroline! I saw this on Instagram and knew immediately that I was going to love it! Yum – and so comforting as the weather cools! Looks like a really awesome gratin dish, brilliant to use gnocchi. great way to use leftover veggies. Looks like the perfect comfort food – I am a huge fan of gnocchi and what a great way to use up some veggies 🙂 Have a wonderful weekend ahead! It is such a great comfort food, but also because of all the veg it feels slightly healthy at the same time! Your gratin looks to be a great tummy warmer. 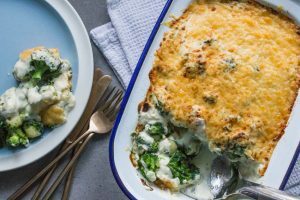 I’ve never used gnocchi in a gratin, but why the heck not. Clever thinking. It’s so quick to use gnocchi rather than sliced potatoes! soups are all well and good, but this is an even more appealing way to use leftover veggies! bravo!